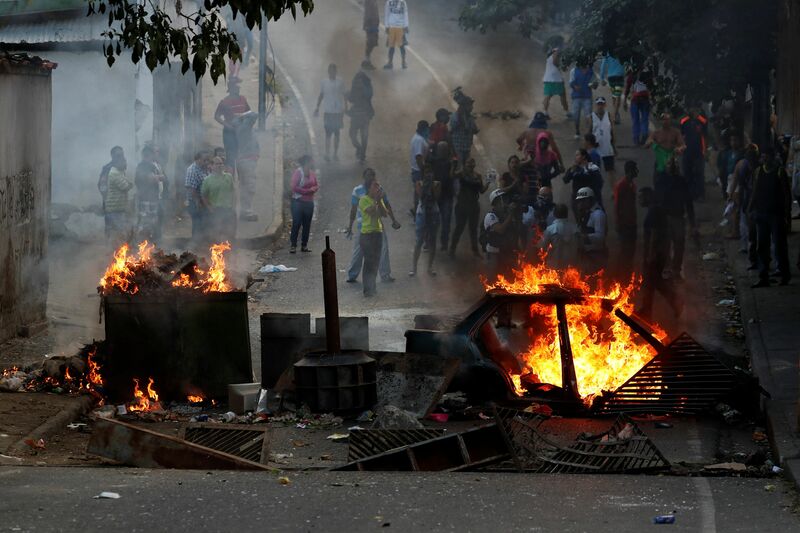 Several National Guard members have been arrested after rebelling against the Venezuelan government. The men allegedly rebelled against the government of Nicolas Maduro, according to the defence ministry. A video that surfaced on social media earlier today shows the officers calling for the removal of Maduro, who was sworn in for a second term earlier this month after a controversial election last year. The officers reportedly took weapons from a National Guard post in Cotiza, Caracas. The ministry of defence released a statement saying that a group of National Guard officers had taken weapons from the post and taken four officers hostage. The statement adds that the group went to Cotiza after taking the weapons from a post located in Petare. It is currently unclear if the men were surrounded or handed themselves to authorities. The statement adds that the weapons taken from the post have been recovered and that the men are being questioned. The rebellion sparked protests in the area, with images and videos shared by opposition websites showing residents barricading roads and burning tires and other objects. The residents took the opportunity to show support for the rebelling officers as well as show their unhappiness for the current state of the area. In the videos, the residents complain about the lack of water and other problems. Venezuelans have been affected by power and water cuts for years. The government often accuses the opposition and supporters of sabotaging the energy sector. The protests and rebellion comes a year after rebel police pilot Oscar Perez threw grenades at government buildings. Perez went on the run for months and appeared in several videos in which he spoke against the government. He was later killed in a shootout against security forces. Images and videos from opposition websites reveal that other areas of Caracas have taken the streets to show support for the officers. There are little details on the officers who participated in the rebellion but one video appears to show a family member of one of them. In the video, the woman explains that she is a family member of one of the officers detained earlier today. Just days ago, several Venezuelan soldiers appeared in a video speaking against the government. The video was taken in Peru, a country that has taken in hundreds of thousands of Venezuelans since the crisis began. In recent months, small groups of security forces have fled or spoken against the government. High ranked officials have sworn loyalty to Maduro but many believe that there is discontent among a large percentage. Many are said to be unhappy with Maduro beginning his second term since the situation in the country has only gotten worse. Maduro won a presidential election last year but that was surrounded by criticism and controversy from the very beginning since the election was moved up. Part of the opposition also decided to stay away from the election, which saw Maduro win by record numbers despite images showing empty voting centers across Caracas and other cities. Maduro was sworn in for a second term earlier this month but many countries have made it clear that they will not recognize him as president. Juan Guaido, President of the National Assembly, has announced that he will step in as interim president. He has also called for a protest on January 23. Government officials said earlier today that they do not recognize him as president.